On this Trilogy of one day workshops, we will create a moving vision board of our dreams and our souls' deepest desires, so they can manifest into reality on our physical realm throughout 2019. We will be journeying together, using various creative tools, to bring the dream into full aliveness and expression, in a sacred and joyful co-creation with Spirit. 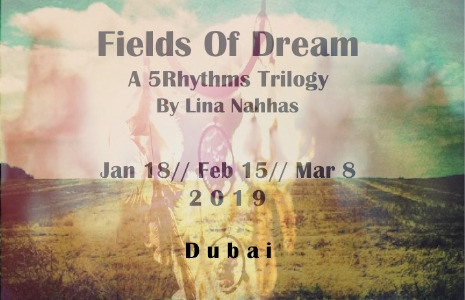 It will all be rooted back into our moving bodies and throough the 5Rhythms map, for a deeper and more visceral experience that can move the dream forward with every moving breath of our body and unfold its details as we go on with our daily life off the dancefloor. This trilogy was intended as a closed ongoing group of same participants journeying together. Commitment to all sessions is key to expanding the manifestation of each of our dreams exponentially from the power of the group’s intention. However, we have now opened this up to one-offs instead of "all or nothing", due to travelling participants, although a less favourable option. No previous experience required; just a curious mind! 650 dhs for one-off sessions.